"How automatically move members files to test categories of a tournament tree?". 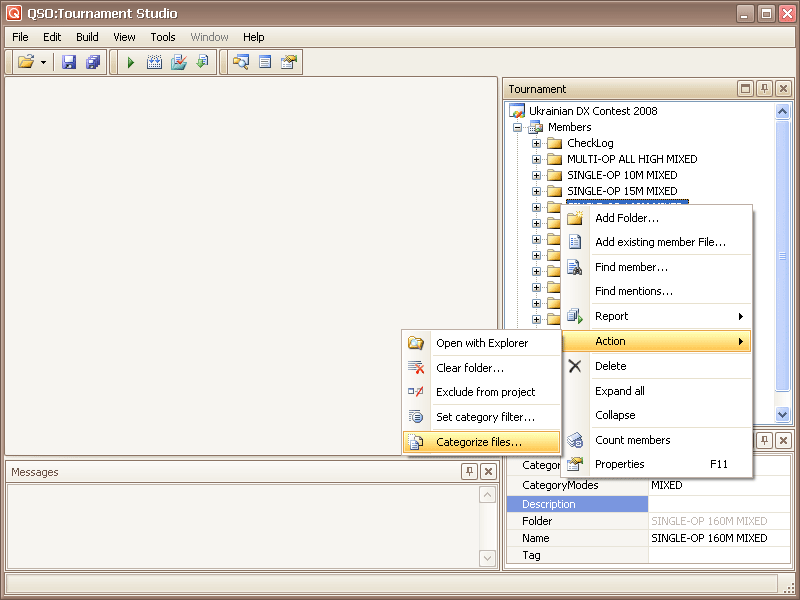 Realization is possible on the analysis of heading member file and allocation of a test category. It is necessary to consider as "best practice" the requirement of instructions of a test category in a member file strictly in a certain format. It is important to stipulate at once, what values is admissible to use in tags of the description of a category. Small discrepancies can be eliminated preliminary processing of members files by a judiciary board. The category is underlined in a tag CATEGORY of member file (Cabrillo). For example: "SOAB MIX", "SOAB CW", "SOAB SSB", "MOAB MIX", "CHECKLOG". Another way - use of symbols is possible: (A, B, C, D...). The category is underlined in a tag group. The basic requirement - uniform underlined all participants of a test category (all specify equally, by a variant 1 or by a variant 2). Deviation by participants from this requirement and instructions of a test category in the form which is distinct from the described is not welcomed. For example "CATEGORY: Single operator CW+SSB 160M-80M Low power" - is bad practice. If initial members files meet requirements of the predetermined instructions of a test category, it is probably essential to facilitate work on move in category folders of tournament tree. 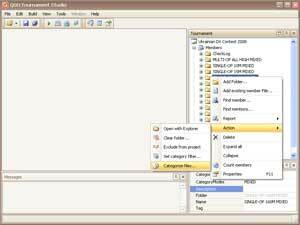 The categorisation of files consists in preliminary copy files in subfolders in file system. It allows to be convinced from correctness of performance and to add files in tournament categories (see also Addition of files in tournament). The context menu "Action" (for a folder or node "Members" of a tournament tree) contains point "Categorize files...". This action allows to categorize source members files. 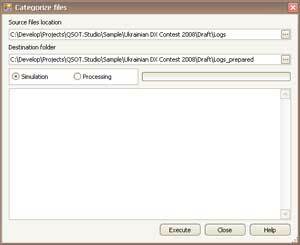 Specify a folder with a totality of initial files, and a folder in which it is necessary to place result of processing. 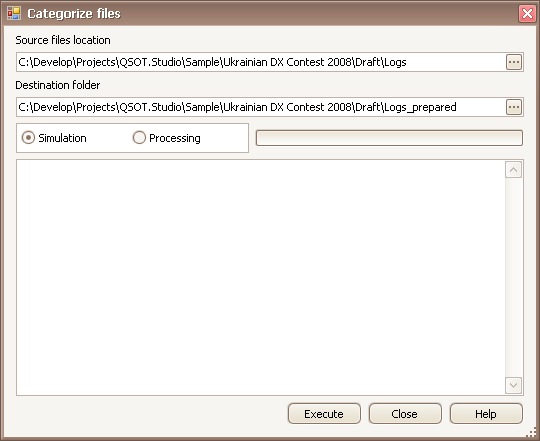 Action can be executed in "Simulation" mode - the preliminary analysis of initial files but a categorisation (copying of files) is thus made not carried out. For real performance of action it is necessary to switch a mode to "Processing". Process start by button "Execute". 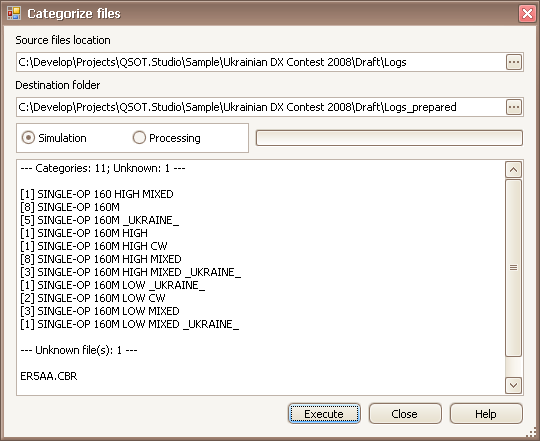 Each initial file is copied in a folder with the name corresponding to its declared test category. Upon termination of the report containing the information on quantity of created folders, their names is formed, initial files for which it is impossible to define a test category (these files are listed copied in a special folder with name "UNKNOWN"). 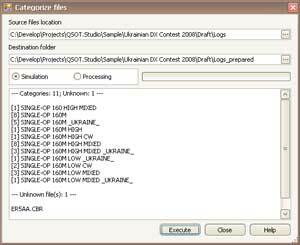 The folder with initial files contains all files prepared for a categorization. Quality of result depends on uniformity of the description of a test category in files of participants. 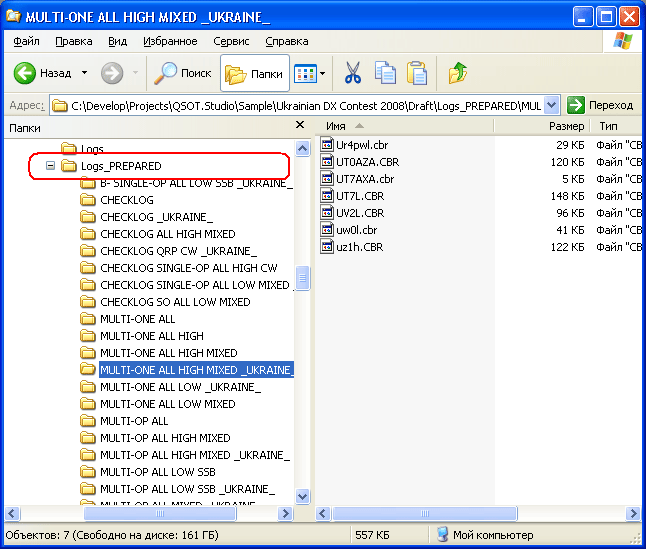 The categorization of files consists in preliminary copy files in sub folders in file system. It allows to be convinced from correctness of performance and to add files in tournament categories (see also Addition of files in tournament).